It doesn't rain a lot in Ohio but when it does, I can always count on my trusty rain boots to keep my feet dry. It's been raining quite a bit this past week and I basically lived in these. The great thing about these boots is that they look like regular boots. They're easy to slip in/out of and super comfortable. I bought mine a couple years ago but you can check out this year's version here. I would own a second pair if there were more colors to choose from. Pearl necklace and earrings: Thanks, Jean! I love the print of your dress and great rainboots!! 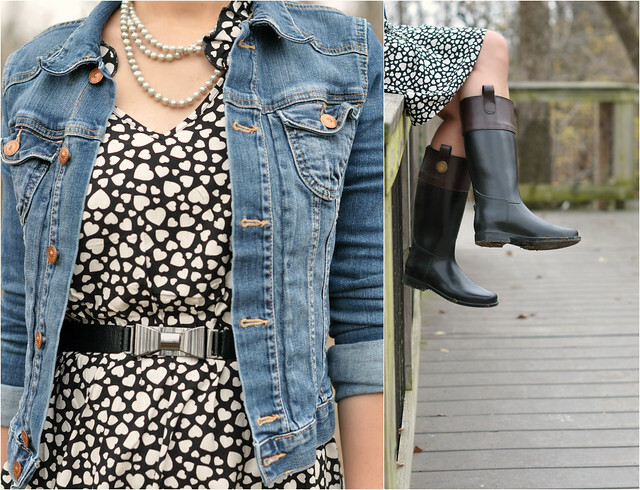 such a lovely dress and i like it paired with the rain-boots and casual denim jacket. Love the photos, Sydney. The dress is adorable on you and I like the added belt! i like the boots on you, a lot! I love the rain boots. They have an equestrian look about them. I also love the cute bow belt. Love your dress and boots, you look so cute! Love the cute hearts, bow belt, and very cool looking rain boots!